Mute Connection is a fluid system of water encapsulated within an intricate tube system, penetrating a tabletop, branching at four positions, leaving two ends open. 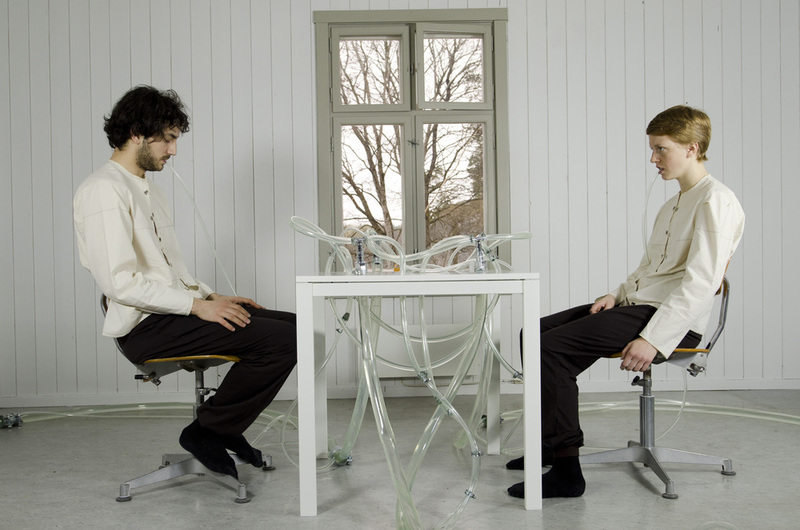 The system is sustained by two bodies, placed on chairs on opposite sides of a table. The open ends of the tubing go to the mouth of the bodies. An enclosed system is formed. The rhythmical breathing initiates a silent movement of water in between them. Part 2 is installed in the dining room, as a part of “The House Project – en matsal, ett sovrum, ett kök och en toalett”. An own initiated project where I am transforming an old wooden house into a sterile laboratory inside, with ongoing performances in several rooms. Apart from Mute Connection, there is three more performative installations in the different rooms of the house; “A potential zone for reproduction” kitchen area), “Sketch for Bed Construction” (bedroom) and “Public Toilet” (toilet).